Time is truly illmatic…and chronology is filled with irony. During my last review for the Jungle Brothers debut Straight Out The Jungle, I mentioned I first heard of the JB’s on “Buddy”, a classic Native Tongue posse cut on De La Soul’s debut album 3 Feet High And Rising. Ironically (or illmatically), 3 Deep High And Rising just so happens to be the next album in my collection. But before we get into the review, let’s go back in time, a bit. Kelvin “Posdnous” Mercer and Dave “Trugoy” Jolicoeur first hooked up in high school back in 1985, while they were both part of a local Amityville, Long Island group, Easy Street, where Posdnuos deejayed (under the name DJ Soundsop, which is Posdnuos spelled backwards) and Trugoy beatboxed and went by the alias (which is also his middle name) of Jude. Easy Street didn’t last, but it did cement a working relationship between Dave and Pos that would eventually lead to the two forming their own group. A friend of their’s introduced them to Vincent “Maseo” Mason, and De La Soul as we know it was born. Mase knew Prince Paul who was a part of Stetsasonic, who already had a deal with Tommy Boy at the time. Paul would be responsible for introducing the label to De La Soul’s unique flavor. And as they say in the business, the rest is history. 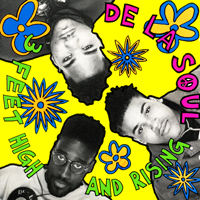 In 1989 De La Soul released they debut album 3 Feet High And Rising, ushering in the D.A.I.S.Y. age (a ridiculous acronym for “da inner soul, y’all), which with a little help from the album cover, label A&R’s, and De La’s “different” style, led many to mistake the trio as a “soft hippy” group (which whould lead to some physical altercations while touring), and by the time their sophomore effort was released the trio had completely denounced the D.A.I.S.Y. age (hence the reason for the title of the second album, De La Soul Is Dead). 3 Feet High And Rising would go to earn a platinum plaque and received heaps of critical praise (including 5 mics in The Source) for its unique style. So without further a do, let’s give her a listen. Intro – The concept for 3 Feet High And Rising is loosely based around a game show, ironically titled 3 Feet High And Rising. The intro introduces the 4 contestant, which consists of the 3 plugs and Prince Paul (who sounds like he’s was caught in mid stroke of a masturbation session during his introduction). Then the anonymous host (played by Don Newkirk, who also did some voiceover work on 3rd Bass’ “The Gas Face”, which Prince Paul also had a hand in) hits them with 4 ridiculous questions. Trust me it works and makes more sense after you’ve listen to the entire album. The Magic Number – Posdnous and Trugoy tag team the mic over this hippyfied masterpiece. Right from the jump Pos hit’s the listener with his cerebral rhymes and Trugoy sound decent as well. The beat sounds like it was taken from a skit from an episode of Sesame Street, but still manages to work. Right from the jump De La establishes their own brand of hip-hop, proving that a 3 man crew is the magic number. Change In Speak – Picking right up where they left off on the previous song, Pos and Trugoy wax poetic over this mid tempo-borderline-lazy paced track. I love the horn samples sprinkled on the hook. Cool Breeze On The Rocks – Mase gets to shine as he scratches up several different vocal samples that use the word “rock”. I’m not a huge fan of deejay joints, but this was hot. The fact that it only runs 48 seconds helps too (the last few seconds of this cuts back to the game show with contestant #1 unable to answers the questions given on the intro). Can U Keep A Secret – Prince Paul adds his zany touch to this interlude: over a jazzy, horn drenched track, Prince Paul whispers insults about the plugs and other crew members. This was pretty funny, nice way to break things up. Now back to our regularly scheduled program. Jenifa Taught Me (Derwin’s Revenge) – The plugs give the female joy box a first name… Jenifa. Jenifa meet Jimmy, Jimmy this is Jenifa. You get where this is going. Props to Pos and Trugoy, who could have taken the easy route by being blatantly obvious but instead choose to speak in poetic code, making the listener use a little brain power to comprehend. I love this track, which is funky in every sense of the term. So far all is well in the land of the daisies. Ghetto Thang – Pos and Trugoy sound like two wise philosophers discussing the troubles that burden ghetto dwellers. The track matches both emcees lyrics, beautifully, making this show pretty much flawless up to this point. Transmitting Live From Mars – Prince Paul apparently got a hold of an old French class tape. In french, the lady on the recording keeps asking “What time is it?”, while the man replies “It’s midnight” (who would have known my three years of french would finally pay off in the form of me being able to translate a skit from a De La Soul album). The beat is dope, but the french vocals don’t scream aliens to me. This was either an inside joke or it was just waaaay over my head. Eye Know – The hippy vibe from “The Magic Number” returns for this love rap (noticed I said love rap and not rap ballad, there is a distinct difference). Pos and Trugoy wax poetic about falling for that special someone over this pleasant track, that’s flavored with a whistle and jazzy horns over the hook. LL take notes, this is how you make a legitimate love rap song. Take It Off – This has Prince Paul written all over it: the fellas are in straight clown mode, instructing you to take off everything from converse to hair weave. It wasn’t really funny, but it’s short, so before you’re able to form an opinion either way about it, it’s over. A Little Bit Of Soap – This is a public service announcement from Posdnuos, reminding you to take care of your hygiene. This closes with contestant number two being unable to answer the 4 questions as well. Tread Water – Pos and Trugoy get their Dr. Doo Little on, as they share stories about conversations they’ve had with different animals who inspire the two emcees to keep pushing on (it may sound corny but I like the abstract take on this one). The beat reminds me of “Jenifa Taught Me”, with just enough adjustments to set it a part. I heard Prince Paul wrote a kids rap book a few years back, this probably would have fit in perfectly (that’s not an insult, by the way). Potholes In My Lawn – The plugs use “Potholes In their Lawn” as a metaphor for emcees bitin’ their style. Yeah, it doesn’t quite worked for me either. I’ve never liked this song, and that hasn’t changed today. Say No Go – The plugs discuss the crack epidemic which became very prevalent during the late eighties. Pos and Trugoy tag team and approach the subject manner from a few different perspectives: the user (and in some cases the user’s baby), the dealer, and even the powers that be, that allow it to get in to the hood. In true Native Tounge fashion De La tight ropes this serious topic which provokes the listener to laughter and tears, all within the same 16 bar verse. I’ll add this: Posdnous is one of the most underrated emcee in hip-hop. No, he’s doesn’t have a magnetic personality or animated delivery, but through his career, if you pay attention, he’s consistently brought thought-provoking and impressive lyrics. By the way, I love the Hall And Oates sample, Paul. Do As De La Does – This is another clown session of utter randomness. This is one of the many things hip-hop is missing these day: groups just having fun. The last few seconds cut back to the game show where the third contestant can’t answer the 4 questions either. Plug Tunin (Last Chance To Comprehend) – Plugs 1 and 2 (Posdnous and Trugoy respectively) take care of their mic checks, and while they’re not saying anything important they still sound good in the process. I love the piano sample sprinkled throughout the course of the track. Nice. Buddy – The first posse cut on the album includes Q-tip and the Jungle Brothers discussing one of the Native Tounge’s favorite topics: skinz. The remix of this song (which adds a ladies touch with help from Queen Latifah and Monie Love) is clearly superior to the original, but the original is still dope in its own relaxing way. My only quarrel with this song is the director should have yelled “cut” when the beat went off. Instead your left feeling like you’re Mel Gibson’s character in What Women Want stuck hearing the thoughts of a bunch of horny teenage boys hiding in their rooms watching Bang Brothers videos on the computer. Didn’t need to hear all that, fellas. Description – Each member of the crew introduces themselves to the listening audience (why they waited to do this when the album is nearly over? I don’t know). Q-tip even pops up to turn in another short verse, making this his second cameo in as many songs. There’s another guy and two chicks who get short verses as well, before Prince Paul closes out this short but pleasant experience. This Is A Recording 4 Living In A Fulltime Era (L.I.F.E,) – Pos and Trugoy use a style similar to what Ren attempted (and later what Smooth Da Hustla would perfect) on a few songs on Straight Outta Compton. You know: where he says a phrase and then flips the same phrase and spits it backwards. It’s really not as interesting as it may sound. Overall this song was half a millimeter over the average mark on the ruler, making it clearly the weakest song on 3 Deep High And Rising, so far. I Can Do Anything (Delacratic) – Prince Paul and the Plugs (though this has Prince Paul’s signature written all over it) do a parody of one hit wonder JJ Fad’s “SuperSonic”. No matter how many times I hear this I always laugh at Trugoy’s one liners (especially the line about holding two pieces of do-do in his hands). D.A.I.S.Y. Age – Everything said for “This Is A Recording” applies to this song as well. This ends by taking us back to the game show. Since none of the contestants are able to answer the questions, you, the listener are invited to answer the questions and mail (no not email, I’m talking pony express, this was 89′ homie!) them in with a chance to win an unidentified price (which I’m sure was a De La Soul or Tommy Boy t-shirt, or something equivalent). But the catch is you had to send your answers in with the two proof of purchases found on the artwork insert, which of course means you had to buy the album (this quickly knocked out most of your crew since they all had dubbed copies which you provided from the cassette you actually purchased). Buying the album was the easy part, finding the correct answers for those inane questions is the hard part. Plug Tunin – This sound like a rough draft of the version heard earlier on the album, with a few small changes to the track here and there, but the same verses (or are they?). Not sure why they need both versions…and with that we’re done. The Jungle brothers introduced us to the Native Tongues abstract styling on Straight Out The Jungle with solid effect. But De La’s 3 Feet High And Rising would take that abstraction to another level, far above and beyond 3 feet high, twisting abstraction into a nerdy hip-hop masterpiece that will forever reside in the clouds reclining in the heavens (I know, I went a bit too far). Their funky slash jazz slash hippy production is matched beautifully by Pos and Dave’s thoughtfully constructed rhymes. Did The Source Get It Right? I’ve never liked “Potholes In My Lawn”, but the rest of the album is strong enough to warrant a “yes”. Any hip-hop collection without 3 Feet High And Rising looses all credibility, period. Potholes in my lawn is my favorite track. It’s good to know someone loves hip hop music enough to do something like this. We have similar taste. You should write a book, I would buy two copies. Hit me up on my email. Would love to chop it up. My fave group is de la soul. Thanks for reading! Appreciate the support.